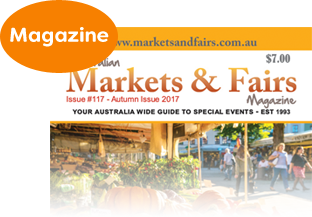 Our E-Newsletter is designed to work in conjunction with the Australian Markets & Fairs Magazine. It will bring you additional information, such as events that did not make it into the magazine by the deadline, or organizers who are looking for particular traders. Please see our Rates & Fees page for a reminder of our advertising deadlines for the magazine and any other special dates etc. To receive our Newsletter please complete the form below.